Because compliance with a QSE management system is an essential step for the efficient performance and sustainability of a company, STANDARD INDUSTRIE and its American branch, STANAM INDUSTRIES, decided to implement practical improvement initiatives. These are dictated by our QSE Policy. the implementation of a highly responsive organization. We have implemented waste management, promoting reuse in house followed by recycling. Our sales and technical staff travels efficiently to limit our greenhouse gas emissions ! 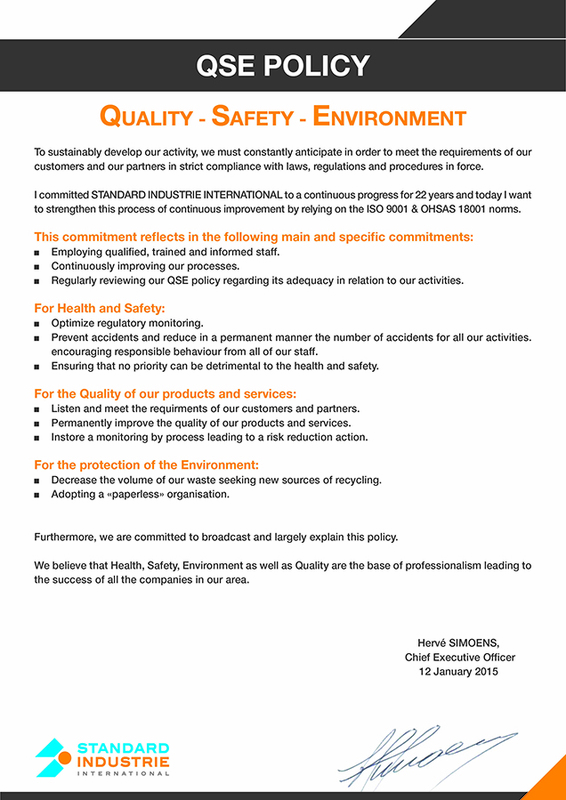 Thanks to the commitment of each of our employees, STANDARD INDUSTRIE International, our headquarters, has been ISO 9001-certified since 1994 and OHSAS 18001-certified since 2012. ISO 9001 : The international Quality Management Standard. The primary objective is customer satisfaction and continuous improvement. OHSAS 18001 : The international standard in the management of Occupational Health and Safety. The objective is to achieve better risk management to reduce the number of accidents, comply with the legislation in force, and improve performance. This logo means that the equipment can be used safely in a potentially explosive atmosphere created by the presence of flammable gases, vapors, mists or clouds of combustible dust. The basis of ATEX certification is European Directive 94/9/EC. The CSA Certificate is issued by the Canadian Standards Association and certifies that a product, process or service has been tested according to Canadian or U.S. standards, and meets the requirements of an applicable CSA standard or any other document recognized as a benchmark for certification. This logo is recognized in the United States, Canada and around the world. The UL Certificate is issued by Underwriters Laboratories to certify that certain products, components, materials and systems comply with specific standards. The letters C and/or U may accompany the logo, and mean that the product may be used in the Canadian and/or U.S. market. The ASME Certificate is issued by the American Society of Mechanical Engineers and certifies that the manufacturing methods of products comply with specific standards set by this society. It specializes in pressure equipment. It allows products to be marketed in the United States.